Indoor swimming pools require serious amounts of maintenance. 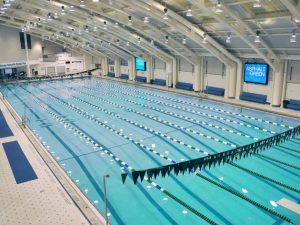 Whether it is used as a community public pool, a specialized training pool for sports or even adapted pools for film and TV, they need to be kept in good order for many reasons. Despite their industrial size, LED lighting can provide a host of benefits. Let OEO show you how. If you think of underwater lighting for pools, you might be thinking of a few spot lights in your neighbor’s hot tub. However, for industrial sized pools, cosmetic light is much lower down on the list of priorities. If the pool requires it, underwater LED lights need to be incredibly durable and safe. Compact florescent light bulbs and metal halide light bulbs are known as gas discharge lamps. This means that they create the light by passing electrical charge through ionized gas. The latter are somewhat more efficient than incandescent light bulbs. However, they are more difficult to make and maintain. Using gas discharge is a danger because the fixtures need to be reinforced to a standard that the water pressure will not break them or cause a fault. In a swimming pool with all that water, lighting fixtures need to be particularly safe as an electrical current entering the pool could be fatal. Another hidden safety benefit is due to the quality of LED lights. By providing blue and white light for inside spaces, they can help athletes to maintain their stamina and not lose to tiredness, even when training at night. A lack of lumen depreciation means this will also happen for longer. Olympic sized swimming pools and those in large industrial sized spaces have other concerns. The lights in these spaces need to fill the whole area, both horizontal and vertical. This is so that swimmers can not only see the area around the pool in terms of health and safety. It is also so that visibility underwater is clear. Bulbs like the high bay LED are able to angle the light so that it fills the space from great height, but does so to the fullest degree. In pools which have high diving boards, this is particularly important. However, these high ceilings have another important factor to consider. The water in swimming pools evaporates, particularly when exposed to the sunlight in high temperatures. In a standard family pool, up to 50,000 gallons of water is lost due to evaporation per year. In industrial sized swimming pools, this amount is considerably more. The result is that the whole building is humid and that water needs to go somewhere. With the security of LED lighting fixtures, it is not going to get into the lights and short circuit them or worse. You can also regulate temperatures much more easily due to their energy efficiency, i.e. less wastage in terms of energy lost as heat. Many swimming pools are housed in old buildings. Whether previously an upper class bath house or simply a repurposed space large enough to house a swimming pool, installing a new lighting system is often very important. LED lights are best suited to both retrofitting old fixtures or even using plug and play bulbs which can be fitted directly with minimal toll in terms of installation. This is very useful in older buildings which want to harness the benefits of greater cost effectiveness, improved energy efficiency and lower overheads. While we briefly mention these three points, they are in no way small and can greatly benefit large swimming pools which are often threatened with closure.